Crawl space vents have proven time and time again that they just don't work. Originally intended to use outside air to dry crawl spaces, they do more harm than good when the air outside is humid, damp, or freezing cold. As an important part of our crawl space repair system, we highly recommend that you seal off your crawl space vents. This keeps outside air away, along with all the moisture, pests, winter cold, and summer heat it brings with it. Our CleanSpace® Crawl Space Vent Covers install quickly, attaching mechanically to form an airtight bond. When we send our crew, one worker can install the vent covers while the others install the rest of your system. A typical installation takes less than one day. And when you have ground-level openings in your home, they're an invitation for pests and rodents enter your home. Termites, carpenter ants, wood-eating beetles, and crickets are especially attracted to moldy, rotting wood, and your vents serve as an open invitation for them. Termites can live undetected for years in a home, damaging the wood and eventually causing serious structural problems. 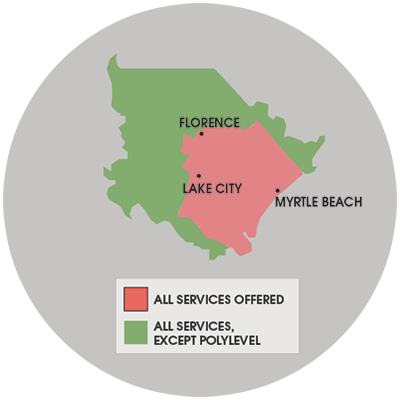 We service Murrells Inlet, Manning, Dillon, Marion, Kingstree, Loris, Cheraw and many nearby areas in South and North Carolina.